A Beverly Grove church is getting into the real estate game, hoping to generate revenue for its congregation while doing its part to help ease the housing shortage in Los Angeles. Our Lady of Mt. 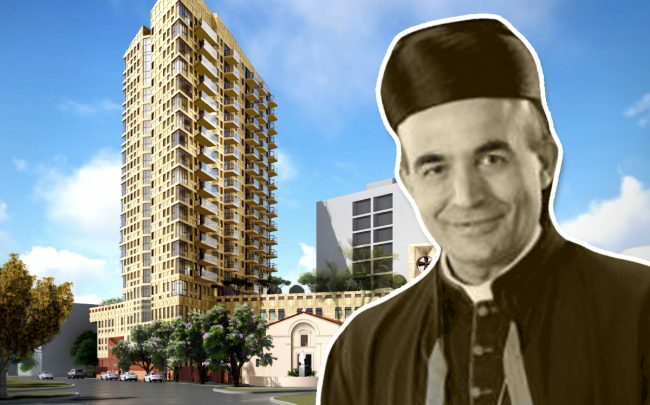 Lebanon has filed plans with the city to build a 19-story residential tower on the site of its cathedral, at 333 South San Vicente Boulevard, it said in an announcement. The Maronite Catholic congregation is looking for approval to build a mixed-use complex that would include 153 apartments, 31,400 square feet of office space and several meeting rooms. Seventeen of the units would be set aside as affordable. As part of the development, the congregation would also rehabilitate its cathedral. It would be taken apart and relocated during construction of the tower. The historic 6,850-square-foot cathedral — built in 1937 — would then be reassembled the tower was completed. Nadel Architecture + Planning has been tapped as the architect. Architectural Resources Group and Los Angeles-based LRM Landscape Architecture are also working on the project. In New York City, religious institutions are increasingly negotiating deals with developers to build housing on their land. The government will also sometimes boost these contracts with financing as it tries to encourage more housing.